After opening to rave reviews, this city's newest hit is The Black Hoof , 928 Dundas Street West, and I was dying to pay them a visit. So last night with three companions in tow we descended upon the teeny charcuterie joint with empty stomachs and panache for some straight up meat. 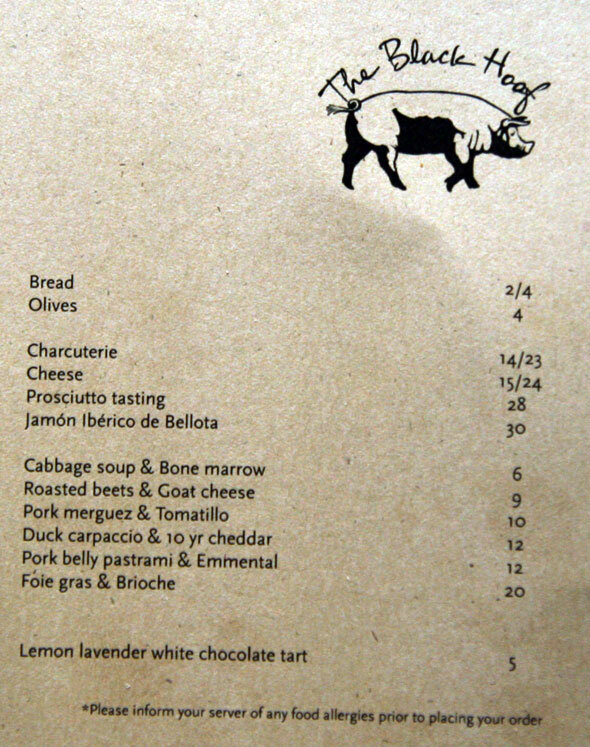 Warning: this restaurant is not suitable for herbivores (unless you're content eating bread and cheese for dinner), the faint at heart (think piggy ears and bone marrow), if you suffer from high cholesterol, if you have no patience (we waited an hour for a table at an unknown bar across the street that had no heat) or if you have no money (cash and debit only). None of the above pertained to us so we whole heartedly and excitedly ordered a bottle of wine and half the menu - serious. Their menu is confidently small and compact and I admire its' no nonsense approach. First came bread from Thuet's bakery ($4) and olives ($4) avec a cute little pit bowl. It's about time someone clued into the fact that pits on your side plate are not only gross but they compete for space when trying to eat something else off the same plate. Smart. 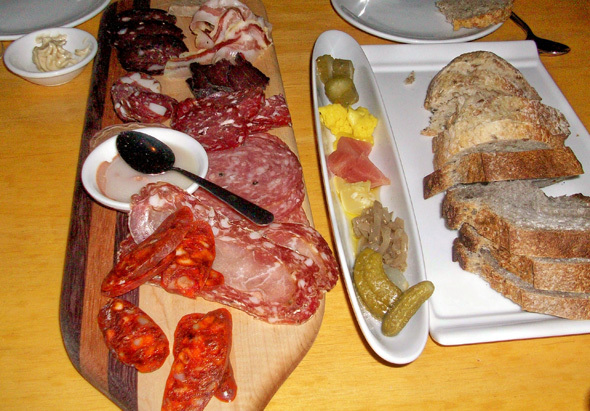 When she brings the charcuterie ($23) we practically squeal like the little pigs that have graciously blessed the platter. It's a farm on a plate. Horse sausage, foie gras mousse, venison brasaola, duck prosciutto and a rainbow of pork products like pancetta, salami and chorizo. All made in house with the exception of the pancetta. It was a carnivore's dream come true. With each sampling, came an element of pleasant surprise. It was salty and earthy and natural. It went so fast someone almost lost a finger. A platter of marinated vegetables makes an appearance. They were sweet but bring on the meat. 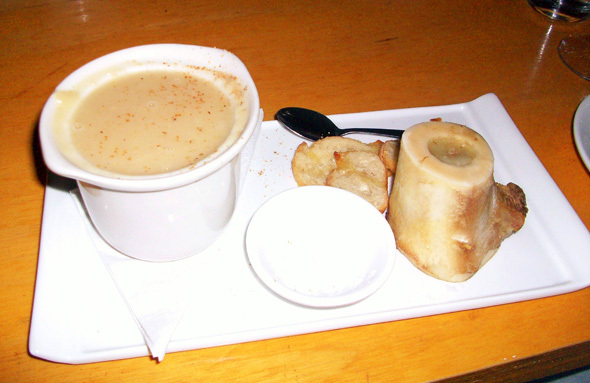 Next up was the cabbage soup and bone marrow ($6). They were stationed side by side and the soup was good but who cares? The marrow was the best I have ever had. The only word to describe this marrow is outstanding. So outstanding that it got ugly as we gnawed and sucked at these bones till every drop of luscious marrow had been conquered. So outstanding that I woke up this morning thinking about it and have continued to think about it all day. Even more outstanding is it's price tag - do they know how good this stuff is? It was perfectly cooked. It was not hard or mealy but rather gooey and kind of wet. The duck confit sandwich ($12) that followed was brilliant. The meat was a stringy, juicy, greasy mess and the crunchy bun was hard to cut in half but a best friend to the succulent duck meat. Oh, the pork belly pastrami ($12). Who in their right mind doesn't like the belly? With its' fatty goodness and tender texture, I have to say that I am a big fan. They serve it up with a mini pickle, a little sauerkraut and the dish makes you smile. We want meat for dessert and I'm secretly hoping for bison ice cream or some other animal concoction. Instead we are told they don't do coffee and dessert is some sort of tart. Like the vegetables, dessert is useless and we call it a night. The service was great and the wine list affordable. The only negative is the washrooms. The stalls look like your grandpa made them at his work bench. We love The Black Hoof's "made in house" philosophy but they could've ordered in the bathroom. Oh well. Overall, the experience was satiating and I can't wait to go back and order the other half of the menu. Writing by Rita Ricchio. Photos by Rita Ricchio and Tim Shore.